The Sonoran Desert in Arizona is a very impressive place. Imagine seeing it for the very first time if you grew up on a dairy farm in rural Vermont. How would you react? Moses Pendleton — who did — was so impressed that he created his own version of it to put on the stage. Although he is not really known as a choreographer, he created his first incarnation of Opus Cactus as a 20-minute work for Ballet Arizona. The year after setting the work on Ballet Arizona, Pendleton decided to preserve his reaction by developing the piece into an evening-length work and expanding the visual images that had inspired him from the Southwestern desert. Last Friday night, Opus Cactus closed the season of the popular Duncan Theatre Dance Series with its performances in Lake Worth. Pendleton, who was a founding member of Pilobolus, has always been fascinated with taking the human form and making it into non-human forms. Often, he has found his inspiration in the plants and animals of the natural world, and together with his creative alchemy, he has made theatrical magic. Take, for example, his absolutely stunning production of Botanica, which was presented four years ago at the Duncan Theatre. Opus Cactus had a 10-year hiatus and was just recently pulled out of retirement. Pendleton spent some time re-vamping and reworking the show. Though the new sequences are filled with a variety of fun props, interesting sets and attractive costumes, they seemed to be loosely and randomly strung together without much attention to flow. The slideshow that emerged — though pleasing — was unfortunately not up to the standard that his production of Botanica had set. Even though many of the sequences in Opus Cactus were quite marvelous on their own, Botanica is a hard act to follow. Performed for a sold-out and eager audience, Opus Cactus began with the simple but effective imagery of a silhouette against a red scrim that captured the essence of a desert sunset. The defined female form of Lauren Jaegar with her stark, etched and dancerly shapes introduced us to the strange life forms of the Southwest. Throughout this show, the female performers’ strong dancer lines and training flirted with transforming Momix’s theatrical emphasis to more of a dance presentation. 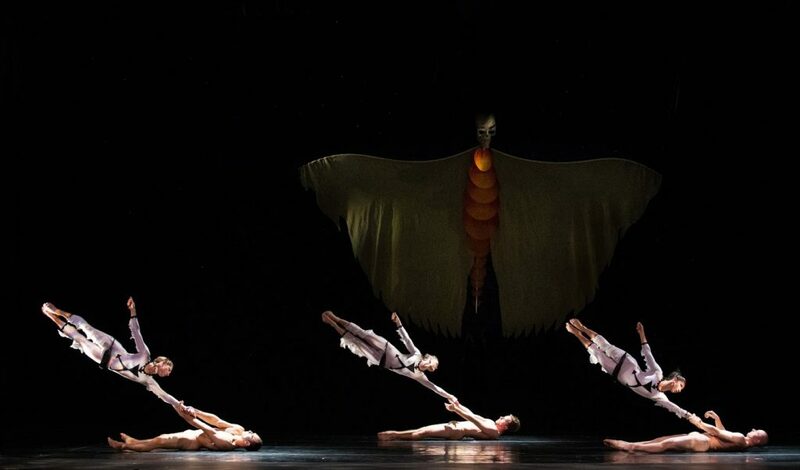 As with all Momix shows, what you enjoyed really sticks in your mind. There were more silhouetted shapes — connected bodies that became strange formations (“Prickly Pairs”) and jumping spiders (“Black Mesa”). There was some fantastic gymnastic partnering (“Ostrich of the Imagination”). There were even skateboard-enabled insects that glided low and flat across the stage (“Tracking the Earth”) that later morphed into a strong visual (“Caravan”) where the women were suspended as they engaged in a slow-motion walk supported by the men who lay on their backs unhurriedly propelling the skateboard — her knees held in his hands and her feet attached to his knees. “Pole Dance,” with Jason Williams, Greg DeArmond, and Matt Ortner was engaging. As the three men vaulted themselves slowly on the ends of their long poles, I yearned to have my own pole not only to experience that sensation but to use it as a great form of new exercise. The use of the pole was revisited in the second half of the program with the addition of women who hung to the now-lifted poles like trapeze artists (“Big Pole Dance”). The second half of the evening opened with a fascinating duet performed by Beau Campbell and Greg DeArmond. Requiring enormous strength and control, the shape of the two connected bodies were hardly recognizable as human. Campbell hung forever over DeArmond’s back from one knee as their available appendages unfurled and refurled like time-lapse photography of a plant growing. There were selections that were reminiscent of a magic show where a back curtain was drawn and then opened to reveal the trick. In “Meritation,” 4 men were revealed in the darkness — upside down and balanced on their heads — with just their faces illuminated in a pin light. Nothing moved except their mouths that continued a silent conversation until they lifted their arms and seemed to miraculously hover. It was just a short illusion during which I spent all my time wondering how were they able to do this trick. Then, before I could figure it out, it was over. “Sundance” had an Asian touch, with its trio of women in with yellow dresses manipulating large paper fans that alternated between being part of their skirts or being rays of sunshine. The last work, “First Contact,” was entrancing. It was an aerial work that had three women suspended in harnesses making swinging and circular patterns in the limited space of the Duncan stage. There was an enormous, macabre puppet with a skeleton face and waving in the wind upstage. I couldn’t help wondering what was it doing in the program and at the closer. Even though Opus Cactus was not as cohesive as other evening-length works that the company performs, it was accessible and enjoyable. 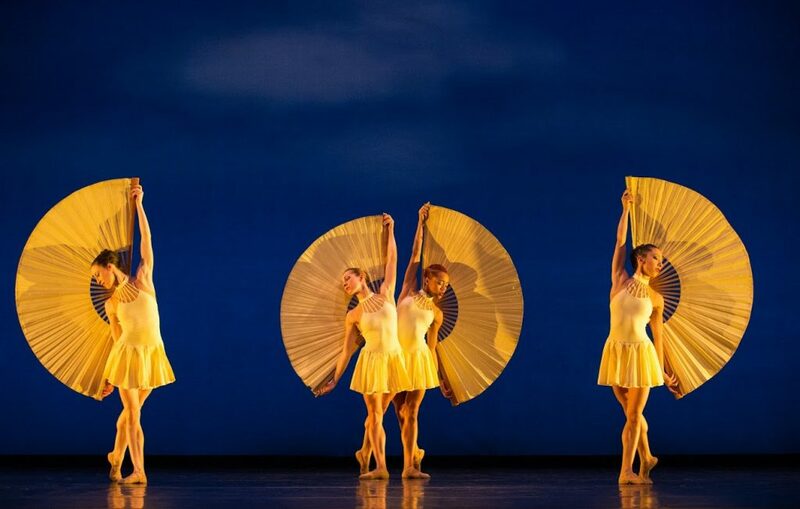 Momix’s shows are, after all, designed to entertain and their popularity has had the troupe traveling the world for the last 35 years with sometimes as many as three productions being performed at the same time on three different continents.